The inscription on the reverse refers to Maria Ghiringhelli, whose family owned the Galleria del Milione in Milan in its early days. 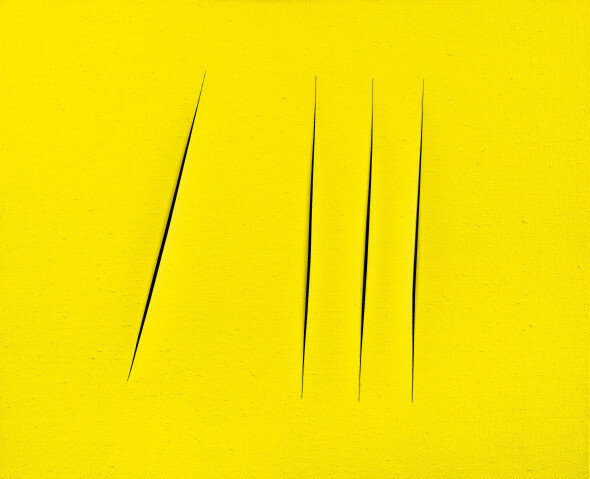 Opening up the canvas with four dramatic cuts, Concetto Spaziale, Attese is a radically conceptual yet lyrically beautiful display of Lucio Fontana’s definitive cycle of tagli. Three almost identical cuts are incised into the canvas, intercepted by a fourth, slightly diagonal slit that emphasizes the heightened complexity of this serene composition. The arrangement of the cuts alludes to the ontological strength of the cut, suffusing the work with a sense of movement that evokes the physical and performative aspect of slashing the canvas. The chromatic power of bright and intense yellow is not only linked to the symbolic power of light and creation but is contrasted by the deep black gauze. Conceived in the final years of Fontana’s life, Concetto Spaziale, Attese stands at the very height of the artist’s compositional process, merging his artistic maturity and experience with the gestural expressiveness of elegant cuts. Immersed in the luminosity of vibrant yellow, the present work echoes the reflections of German poet Johann Wolfgang von Goethe, who deliberated upon the role and psychological effect of colour in his famous treatise, ‘Theory of Colours’ from 1810. Goethe stated: “(Yellow) is the colour nearest to the light… In its highest purity it always carries with it the nature of brightness, and has a serene, gay, soft exciting character” (Johann Wolfgang von Goethe, Theory of Colours, London 1840, p. 306-7). The brimming vitality of the flat chromatic surface is juxtaposed by the three-dimensionality of the four narrow slits. The complex arrangement of vertical and diagonal cuts not only heightens the physical exploration of the canvas but emphasizes the sculptural materiality of the work. As the viewer mentally retraces the act of perforation, Fontana folds time and space into one and thus achieves a state of serene contemplation. The inscription on the reverse of the present work says "è venuto [sic] a trovarmi / Maria / Ghiringelli [sic]". Maria Ghirghelli was the daughter of the owner of Galleria del Milione in Milan. Since Fontana had returned to Italy from Argentina in 1947, Milan had become the epicentre of avant-garde art. Fontana’s experimental practice, which was firmly rooted in scientific developments and linked to contemporaneous events such as the developments in space travel during the 1960s, catapulted the artist to the very forefront of the radical Milanese art scene. Of all the series that Fontana engaged with during the final decade of his life – such as the visceral Olii or the punctured Buchi – the Tagli in particular denounced any decorative elements and emphasized the existential nature of the gesture. Engaging with the matter and the form of painting, the canvas is liberated from its static two-dimensional representational obligations. Supported by his theoretical writings and his first manifesto, the Manifesto Blanco from 1946, Fontana embarked on his own spatial journey when he conceived the first of his ground-breaking taglio in 1958. In the ensuing decade, Fontana would tirelessly advance and refine his technique, commenting that “with the slash I invited a formula that I don’t think I can perfect. I managed with this formula to give the spectator an impression of spatial calm, of cosmic rigour, of serenity in infinity” (Enrico Crispolti, Lucio Fontana, Catalogo Ragionato di Sculture, Dipinti, Ambientazioni, Vol I, Milan 2006, p. 105). Uniting all of these aspects into one work, Concetto Spaziale, Attese forges a delicate yet powerful dialogue of colour and form while the cosmological evocation of time and space firmly positions the work within Fontana’s celebrated pantheon of tagli paintings.